Anesthesia Care And Web-Surfing May Not Mix, Nurses Say : Shots - Health News Is the operating room staff Facebooking when they should be monitoring vital signs? The nurse anestheticists say that's a potential patient safety problem. Distraction is a well-known safety issue in the OR, but there's been very little research on whether smartphones are contributing to the problem. The next time you're being wheeled into the operating room, you might want to ask the medical professionals there to lay off the eBay and Twitter apps on their phones. That's the word from the nation's nurse anesthetists, who just came out with a new policy urging OR staff to use their smartphones for the practice of medicine, not Facebooking. The policy is a bit vague, in part because no one's really studied whether it's risky for healthcare workers to use smartphones for "non-essential" web time at work. But there are plenty of anecdotes of nurses playing "Words with Friends," surgeons chatting away on their phones, and anesthesiologists browsing the web. Sounds like a lot of other workplaces. But it's a workplace where the patient's life is at stake. One study found that 55 percent of perfusionists, the people who run heart-lung machines during heart bypass surgery, said they had texted, emailed, or otherwise used their phone during the procedure. About 80 percent said that cell phones could pose a significant safety risk to patients. That disconnect squares with other studies showing that people think that texting while driving is dangerous, while laboring under the erroneous impression that they can do it safely. Although there's been debate about whether phones should be banned from the OR, surgeons and other professional societies haven't been willing to go that far, instead saying that OR personnel should "minimize" personal use of phones. But some hospitals, like Beth Israel Deaconess Medical Center in Boston, are coming up with guidance for doctors on how to avoid distraction on their mobile devices. OR staff do use smartphones in their work, to look up medications or rare diseases, or even to text the patient's relatives. 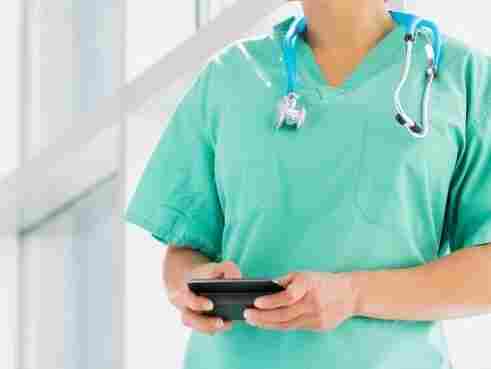 "The challenge is to keep the mobile device focused on the issue at hand," says Lynn Reede, director of professional practice for the American Association of Nurse Anesthetists. Given that when most of us are unconscious while in the OR, what's a nervous patient to do? "I don't see any reason why a patient couldn't ask [staff] what they'd be doing while they're providing the care that day," Reede told Shots. So put that on your pre-surgical checklist: Please no Facebook while I'm under.